On vacation to the city of Segovia in the Sierra de Guadarrama? : Royal palace with 300 rooms at the foot of the Sierra de Guadarrama 80 kilometers north of Madrid and 12 kilometers east of Segovia. It was the summer palace of King Philip V of Spain and is in baroque style. It is the Spanish version of Versailles. Highlights include the fountains in the gardens. : Royal Palace of Riofrio (1751), 10 kilometers southwest of Segovia. Built as a hunting pavillon. : One of the most beautiful castles of Castile and Leon in the northwest of the province of Segovia. A good example of Mudéjar military architecture. The castle is entirely built of brick. : Very nice situated walled city on top of a rock. Top attractions: the aqueduct of Trajan, the rebuilt cathedral and the Alcázar (castle). The castle has been the inspiration for the Cinderalla Castle in Disney World. : Walled town 35 km northeast of Segovia. Breathes the atmosphere of an open air museum, particularly interesting is the Plaza Mayor. Soon Segovia webcam, blogs, travelreports, spanish recipes and movie locations. 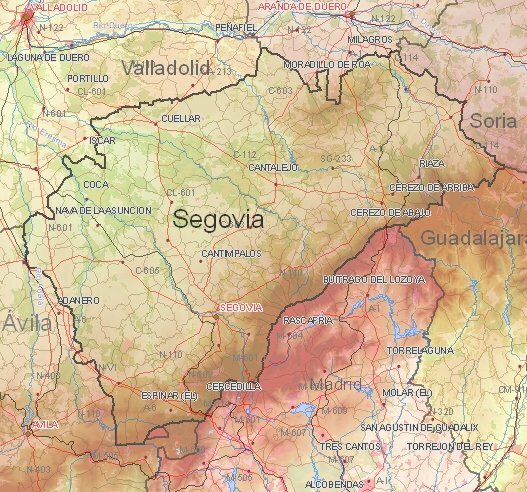 1) Current weather in Segovia (temperature, precipitation).